Green screen studios are one of the most versatile spaces to shoot a wide range of photo, television, film or commercial productions. However, you’ll need a professionally designed and well-lit stage if you want a quality end result that doesn’t just look like it’s been cut and pasted onto a virtual background. 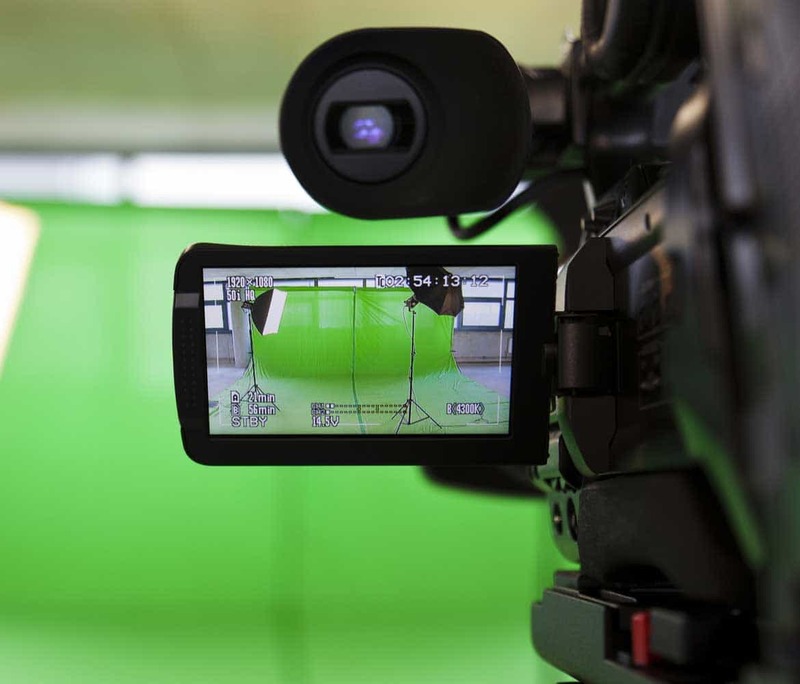 Here, you’ll find everything you need to know about the benefits of using a green screen and how to find the best green screen studio Los Angeles offers meet all of your production needs. WHAT IS A GREEN SCREEN ANYWAY? A green screen studio is a large, empty space that’s set against a background that’s painted a specific shade of green. They’re used as the backdrop for chroma key photography or filmography whereby another background is digitally superimposed onto the image or film using a post-production technique called chroma key compositing or chroma keying. Traditionally, before film became digital, green screens were typically blue. This allowed the foreground image to be processed so that it appeared to be on an opaque background which was then overlaid onto a separate background to create the final effect. While the background of a green screen studio can be a flat wall, a curved, cyclorama background is preferred as it allows for greater camera angels, better lighting and a more flawless finished piece. Green screen studios are typically used for newscasting or creating scenes for movies, television shows, video games and/or music videos that would otherwise be impossible or impractical to create in real life. Therefore, while the finished shot may show an astronaut floating in space, they were most likely suspended using wires from a pipe grid that lays over the top of a green screen in a studio space. However, these days, green-coloured backgrounds are typically preferred as digital cameras are more sensitive to green light. Green also contrasts more dramatically with the subjects as the particular shade that’s used doesn’t match any natural skin tone or hair colour so the actor won’t accidently be edited our when using chroma key. Having an unlimited choice of backgrounds –Because the background is digitally imposed, film producers are able overlay a variety of backgrounds onto the foreground image. This allows for greater creativity and flexibility to find the perfect look for the finished piece and eliminates the need to set up and/or re-shoot scenes if the concept is later changed. It also allows the same footage to be updated later if required. This can be particular useful when brand colors and/or logos change as the current photos and video material doesn’t need to be re-shot to match. Reducing set-up time – In addition to not having to travel, using a green screen studio in Los Angeles makes setting up a set very quick. While you may still want to add props on front of the green screen, the background and lighting generally won’t need a lot in the way of modifications. Cost savings – Because filming on a Los Angeles green screen is fast and efficient, it also helps to drastically reduce production costs while making it more likely that you won’t end up going over budget to finish your piece exactly the way you’d like. Eliminating the need for travel – When using a green screen studio Los Angeles may be the only location that’s required to filming, saving time and production costs in moving the whole cast around to film different parts of a movie, television, commercial or any other application. Providing greater control of the filming environment – Working indoors means that you won’t need to battle with the elements, surrounding noise or wait for the right natural lighting to shoot. Simultaneous Audio Recording – If the majority of green screen film applications were recorded on location, it would usually be impossible to simultaneously record the scene dialogue as production sound. However, when using a soundproofed Los Angeles green screen studio, it’s practical to film the natural scene sounds and overlay any background noises digitally which is generally easier and less time consuming than working the other way around. WHEN SHOULD I USE A LOS ANGELES GREEN SCREEN STUDIO? If you’re an amateur or professional photographer or film producer who’s looking for an expertly designed space that gives you the flexibility to create a set that would otherwise be difficult, impossible or prohibitively costly to design in real-life, your answer can be found in the best green screen studio Los Angeles has to offer. 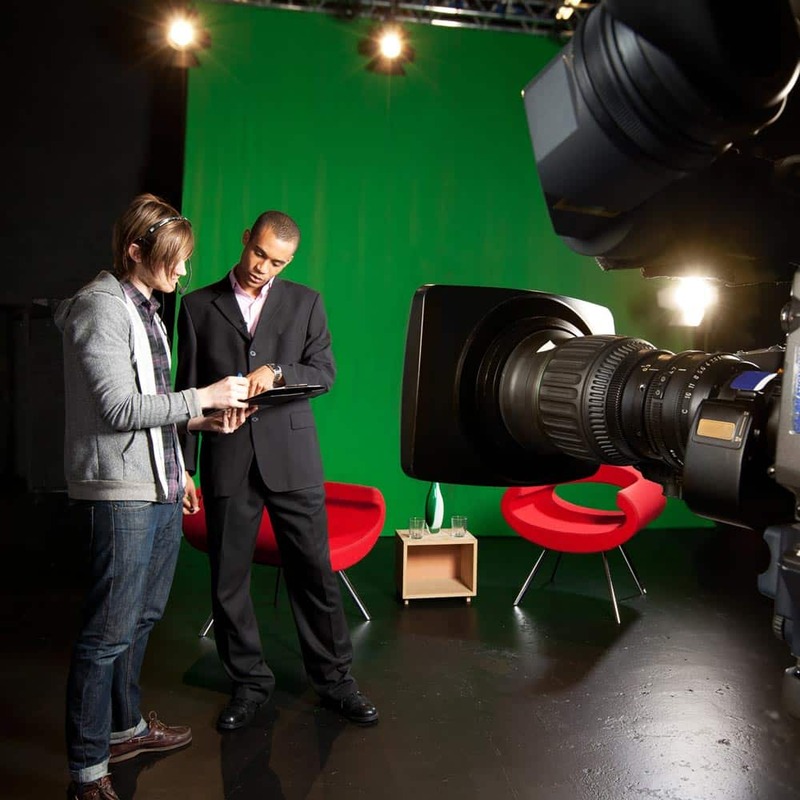 Los Angeles green screen studios are perfect for filming news broadcasts, commercials, infomercials, music videos, shorts and any movie or television scene that requires a virtual set and/or special effects. In addition, green screen studios in Los Angeles have recently become popular locations for YouTube and other social media starts to quickly and affordably produce a series of material.They’re also ideal for any type of photography application whereby your model and foreground scene is to be digitally laid on top of a separate background image. When it comes to creating a perfectly edited final shot, there’s a big difference between using a simple sheet of green and a professionally designed Los Angeles green screen studio. Therefore, it’s essential to invest a bit of time in finding the best sound stage Los Angeles can offer you and your crew. When it comes to the green backdrop that can make or break the quality of your project, it’s essential that a proper chroma green paint is used. This not only ensures that you’ll be able to crisply separate your subjects from the green background during post-production, but also acts to bounce the light around in a way that reduces the development of colored ‘hot spots’ that can pollute skin tones and project a slightly green tinge onto your subject. When cheap, generic green paint is used in place of quality, dried chromakey green screen paint, even the slightest bit of shine can pollute fair skin tones and make oily or darker skin tones show up with an uneven edge. Once you’ve confirmed that the correct green chroma paint is used in your Los Angeles green screen studio, it’s also useful to visually inspect the walls. A properly constructed green screen studio should use cyclorama walls that are curved to meet at the corners and bounce the light around appropriately. Using the studio lights, inspect the surface of the walls to make sure that there aren’t any defects that cause shadows to disrupt the even color. It may also be useful to ask your Los Angeles green screen studio representative about how often the walls are repainted. Damage can easily occur from things such as moving large props, shoe scuff marks and stunt work. However, regular repainting will ensure that your green screen rental is still in good condition when it’s time for you to use it. Lastly, when looking for the best green screen studio Los Angeles has to offer, also look at the surrounding support and production area. In order to be able to easily shoot from multiple angles and distances, you’ll want to have plenty of room to move your cameras outside of the green screen space. This will give you more flexibility while making it easier to create the specific lighting that you’d like. Other facilities such as a private production room, a wardrobe and hair and makeup area and onsite bathroom facilities will also be very valuable when it comes time to shoot.. If you need the best green screen studio Los Angeles has to offer, you’ll find it at Goya Studios. Located in downtown Hollywood with free parking for easy access for you and your crew, you’ll be able to use your creativity to transport the subjects of your green screen shots to any location you can dream of. You’ll also be pleasantly surprised by our inclusive Los Angeles green screen rental that allows you to make use of your own private support space to hold executive meetings, review your material and prepare your talent for the screen. Whether you’re a professional or an amateur photographer or filmmaker, YouTube personality or music producer, we can cater to your Los Angeles green screen studio needs, large or small. At Goya Studios, you’ll have access to the top green screen studio Los Angeles film producers have at their disposal. 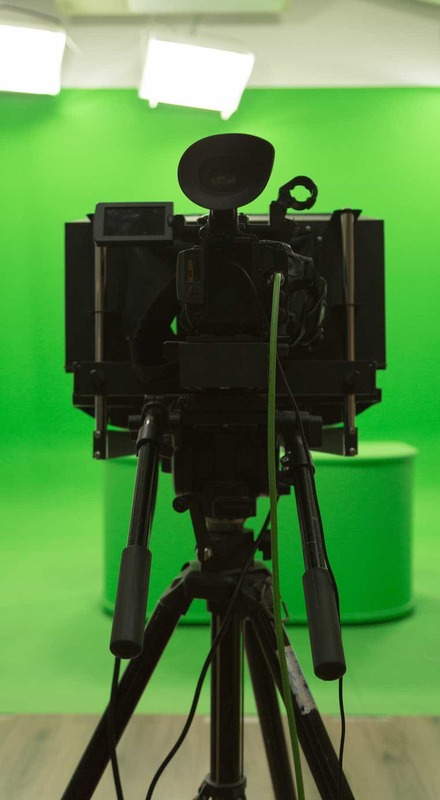 We have 2 green screen studios available for rent that have both been professionally designed, soundproofed and painted for the highest quality results in all sorts of green screen applications. Stage B features a 2-wall green screen that measures 20’ by 21’ that’s ideal for smaller photo, film, television and commercial applications. This cyclorama green screen is topped with a pipe grid that lays 20’ overhead to allow you to hang additional lighting and accessories to shoot any type of scene.There’s also an additional 1550 square feet of supporting space in this studio including a production office, dressing room, private restrooms and a full kitchen. Stage C contains a larger green screen shooting space that measures 52’ by 52’. This is ideal for any of your green screen studio Los Angeles needs. Here the 21’ to the overhead pipe grid provides unlimited potential for stunts and custom lighting. There’s also a large support area including ample space around the green screen platform, a private production office, VIP room, hair, makeup and dressing rooms and private restrooms. We also offer equipment rental, AV packages and full-service catering that can all be customized to your specific needs. These custom packages can include rental of our other production areas including our versatile sound stages, white cyc studios and photography rooms. If after finalizing your shoot, you’d also like to host a special event to celebrate and/or launch your new production, we can host it for you. Our unique event areas give us the flexibility to set up any event theme you’d like with catering for anywhere from 50 to 1200 guests. If you’re looking for a quality shooting spaces that’s perfectly suited to all your green screen studio Los Angeles needs, contact us today. Conveniently located in the heart of Hollywood, our versatile, professionally designed green screen stages are well-equipped with all the additional amenities you and your crew may need. What’s more, we can also create custom green screen studio rental packages that include equipment rental, catering and the use of our other production areas in an affordable, all-inclusive bundle that suits your budget.